New to the scratch map concept? Where have you been? Jet-setting off on your travels? 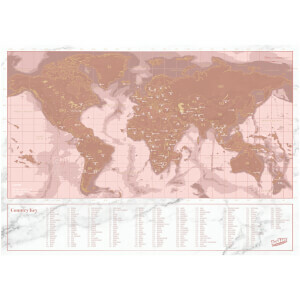 In that case the Scratch Map is the perfect gift: a personalised double layered map that allows you to scratch off the countries you have visited and display for all to see. 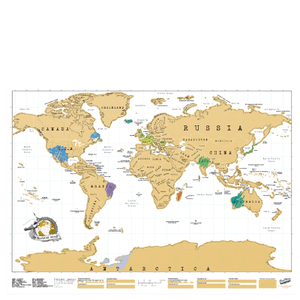 The hugely popular Scratch Map now comes in a deluxe travel size, ready to be flung into a suitcase along with flip flops and sunscreen. What could be more satisfying than scratching off your destinations on the map whilst you are actually there? 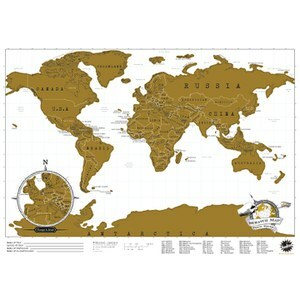 The Deluxe Travel Edition has been created using luxurious matt black paper and gold foil overlay of the same high quality as the original Scratch Map, but this is a smaller, compact version, ideal for travel use. The back of the map contains a wealth of additional facts and figures to whet your appetite for future travels. Scratch off the countries you have visited gently with your fingernail or eraser. The Deluxe Travel Edition is the perfect gift for anyone who has a love of travelling. East to use and it was loved as a gift! My order came two days after ordering which was a lovely surprise! Great quality and fantastic for a gift! Highly recommend! I ordered this with free delivery on a Monday and it came on Wednesday - Fantastic! The product is amazing and very good quality and the perfect size. The packaging though was TERRIBLE and so WASTEFUL!! It was a HUGE box, padded with a load of plastic for one very small 50cm length tube! Why couldn't this have gone in a large package tube, padded with a bit of bubble wrap?? I have pictures to show the huge box and plastic it came in. But the product and delivery were excellent, I just hope you guys reconsider your packaging! !